Researchers found evidence of the degenerative brain disease in 110 out of 111 deceased National Football League players, said study co-author Dr. Daniel Daneshvar. He is a researcher with the Boston University School of Medicine's CTE Center. "A remarkable proportion of the athletes who played at the highest level develop neurodegenerative disease," Daneshvar said. "This is incredibly concerning, because of the sheer numbers" of men who have ever played the game professionally. Evidence of CTE also was found in 91 percent of brains donated by college football players, 88 percent of those from Canadian Football League players, and 21 percent of brains donated by high school players, the researchers found. According to Dr. Gil Rabinovici, an associate professor of neurology with the University of California, San Francisco Memory and Aging Center, "CTE changes could also be detected in some individuals who played at the collegiate and even high-school level, suggesting lower levels of exposure may be sufficient to lead to brain injury." The report includes the autopsy results from 202 brains, with CTE diagnosed in 177 brains. "In this study," Daneshvar noted, "we more than double the total number of cases of CTE in the world's literature." CTE tends to occur in people who experience repetitive brain trauma. It shows up at autopsy as aberrant protein clumps and other signs of brain damage, according to the nonprofit Concussion Legacy Foundation. 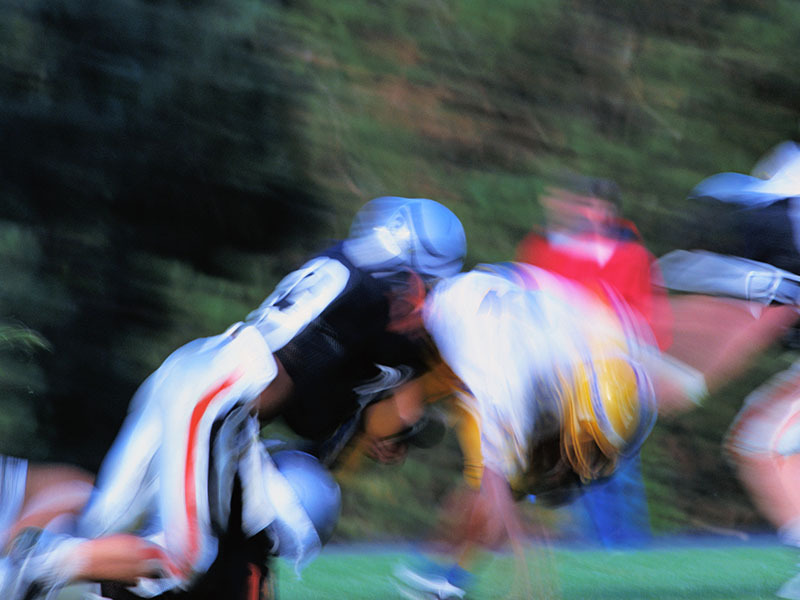 Previous studies have suggested that both full-fledged concussions and sub-concussive blows -- jarring head impacts but not actual concussions -- can contribute to the risk of CTE, Rabinovici said. People with the disorder experience problems with thinking and memory, mood disorders, and behavioral problems, Daneshvar said. Lack of impulse control, aggression, depression, impaired judgment, memory loss, paranoia, confusion and progressive dementia are some of the symptoms that can occur. Prior research has uncovered CTE in dozens of former NFL players. They include Pittsburgh Steelers center Mike Webster; Junior Seau, linebacker for the San Diego Chargers; Ken Stabler, the Oakland Raiders quarterback; and Frank Gifford, running back for the New York Giants. The new study results were published July 25 in the Journal of the American Medical Association. The researchers found that among patients with severe CTE, 89 percent had experienced behavioral or mood problems, 95 percent had had difficulty with thought and reasoning, and 85 percent had had signs of dementia. The severity of CTE found in a player's brain varied with their level of play, according to the new report. Most brains from players at advanced levels showed signs of severe CTE, including 86 percent of professional players and 56 percent of semi-professional or college players. On the other hand, all high school players diagnosed with CTE displayed mild signs of disease, the investigators found. "It's becoming increasingly clear there's a likely relationship between exposure to repetitive hits to the head and development of CTE," Daneshvar said. While the study doesn't prove a direct cause-and-effect relationship, he said the differences in this sample tend to support the idea there is an association between playing football and the development of neurodegenerative disease. Also, no position on the field appeared to be safer than any other when it comes to CTE, Daneshvar explained. "Amongst the NFL and college players, we have a wide array from all positions on the field that develop CTE," Daneshvar said. "It's unclear there was a position that an athlete could play that could not develop CTE." Daneshvar and Rabinovici noted the numbers from this report cannot be applied to all football players in general, since these brains were specifically donated to be examined for CTE. "This is quite a biased sample," said Rabinovici, who wrote an editorial accompanying the article. "The patients were nearly all impaired during life. Families whose loved ones were sick during life are intuitively more likely to commit to brain donation, in part to get an explanation for what caused their loved one's symptoms," he explained. "In addition, the study was heavily weighted towards former professional players, and relatively few patients played at the high school level or lower," Rabinovici continued. "So we are looking at a sample of some of the sickest individuals who likely were exposed to a very high burden of traumatic brain injury." Currently, CTE can only be diagnosed after death. To understand the full extent of the problem, doctors need to be able to detect CTE in living people, Rabinovici said. "Because of the limitations of an autopsy-based study, we really don't know how common CTE truly is in the NFL, let alone in the millions of others who played the game at a lower level, or who participate in other contact sports," Rabinovici said. While new methods for CTE diagnosis are in the works, "nothing is ready for prime time yet," he said.